The weather-related cataclysms of July and August fit patterns predicted by climate scientists, the Geneva-based World Meteorological Organization says - although those scientists always shy from tying individual disasters directly to global warming. The U.N.'s network of climate scientists - the Intergovernmental Panel on Climate Change (IPCC) - has long predicted that rising global temperatures would produce more frequent and intense heat waves, and more intense rainfalls. In its latest assessment, in 2007, the Nobel Prize-winning panel went beyond that. It said these trends "have already been observed," in an increase in heat waves since 1950, for example. It's been the hottest summer ever recorded in Russia with Moscow temperatures topping 100 degrees Fahrenheit for the first time. The drought there has sparked hundreds of wildfires in forests and dried peat bogs, blanketing western Russia with a toxic smog. 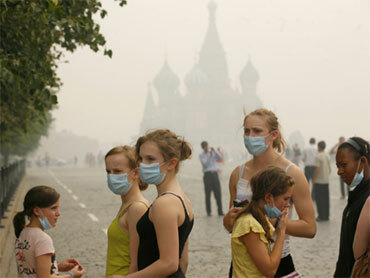 Moscow's death rate has doubled to 700 people a day. The drought reduced the wheat harvest by more than one-third. The heaviest monsoon rains on record - 12 inches in one 36-hour period - have sent rivers rampaging over huge swaths of countryside. It's left 14 million Pakistanis homeless or otherwise affected, and killed 1,500. The government calls it the worst natural disaster in the nation's history. A warmer atmosphere can hold - and discharge - more water. The 2007 IPCC report said rains have grown heavier for 40 years over north Pakistan and predicted greater flooding this century in south Asia's monsoon region. Researchers last week spotted a 100-square-mile chunk of ice calved off from the great Petermann Glacier in Greenland's far northwest. It was the most massive ice island to break away in the Arctic in a half-century of observation. The melting of land ice into the oceans is causing about 60 percent of the accelerating rise in sea levels worldwide, with thermal expansion from warming waters causing the rest. The WMO'S World Climate Research Program says seas are rising by 1.34 inches per decade, about twice the 20th century's average.